What Is The Price Point For Wedding Gowns Offered In Your Salon? Our gowns start at $1500.00 and go up. Most of our designers are in the price range of $2000-$7000. Do I Need An Appointment To Try Gowns At Your Salon? Yes, appointments are recommended so that we may spend time with you listening to your ideas, and offering suggestions. We would like the opportunity to inform about our custom designers and bridal services. We will do our best to accommodate walk-ins. How Do I Know If You Carry A Specific Gown In Your Salon? Please email your questions to our sales team. Please include as much information as possible: style, description, magazine, etc. If we do not have a dress in stock that you are interested in trying on, we will be happy to see if the sample is available to borrow from the designer. This will be an additional charge. Initially, an hour and half is sufficient. It allows enough time to try many styles without overwhelming you. Absolutely. We suggest you bring someone who’s opinion you value . It is important to include the person who will be paying for the purchase. Remember, too many people means conflicting opinions and confusion. In our experience, two to three of your most important loved ones or friends. You don’t want to spoil the surprise. If you are interested in bringing a larger party with you for your appointment, please let us know when you book your appointment. We offer private appointments that can accommodate larger groups for an additional charge. Just yourself, an open mind, and any pictures you may have for ideas. We have all the shoes and foundations you will need. How Soon In Advance Of My Wedding Should I Order My Wedding Gown And Accessories? A bride should allow herself enough time to explore and shop in the beginning and enough time at the end to not be stressed if there is a production delay. A safe and comfortable time frame is 9 months to a year before your wedding. Rush cuts for expedited delivery is available for an additional charge. When Do I Begin My Fittings? Do I Meet The Seamstress At The Store? Alterations done at Jennifer's and are offered as a courtesy to our brides and bridal parties. They are available on a first come first serve basis. During the busy season alterations appointments can book out. We suggest you schedule your fittings several months in advance and begin alterations 10-12 weeks in advance of your wedding. Alterations needing to be done in less than 4 weeks are subject to a $100 rush fee. There is a $25 fee for appointments cancelled within 24 hours and no shows. This fee will be added to your total bill. Alterations are not a set price they are based on what you need. Bridal alterations average $300-$500 and bridesmaids $50-$150. These are just estimates provided for your information. Any changes to your fittings or your gown must go thru your seamstress. We are not responsible for merchandise once it has left the salon. Can I Have My Dress Shipped To Me To Have It Altered In My Hometown? Yes, of course. Shipping is ground unless otherwise requested (price quoted at time of request). We use UPS to ship all packages. We do not ship COD. All merchandise must be paid in full, including shipping, before anything is sent. How Much Deposit Is Required To Place An Order? 60% of the retail price is required as a deposit or payment in full.The balance is due within 30 days of notification that the merchandise has been received by Jennifer’s. All merchandise must be payed in full before fittings begin. Yes, You can change your order or your size until the time it is placed with the manufacturer. Once is it is confirmed by the manufacturer, no changes or cancellations will be accepted. If your order has not been placed, and it is within 72 hours, your deposit minus a cancellation fee of 10% will be refunded in the manner in which your deposit was made. After 72 hours, all deposits are completely non-refundable. NO EXCEPTIONS. Your balance must be paid for in full as stated in your contract. What Do I Need To Do If My Wedding Is Postponed Or Cancelled? Please advise us in writing by certified letter of a cancellation or postponement. You will receive a written response back confirming that we will store your wedding gown/accessories for one year after the scheduled wedding date. After one year if a new wedding date has not been set the gown/accessories must be picked up or they become property of Jennifer’s. Can I Receive An Order Confirmation? Yes, two weeks after placing your order you may email or call us and request a confirmed ship date. How Am I Notified When My Order Has Been Received? You will receive a call or an email notifying you that your merchandise is in and the balance is due. At this time you can schedule an appointment to come in to try on your dress, or you can call the seamstress to schedule your first fitting. Do You Offer Cleaning/Preservation Services After My Wedding? Yes. Please call to make arrangements to drop off your dress/ veil. Price ranges vary from $300-$450. Payment in full is required, as your dress will be shipped to you directly upon completion. Buyer Beware! INTERNET DISCOUNT SITES. Unfortunately the bridal industry has some hidden evils I would like to share with you. Second, it is so important to find a person and a place that you enjoy and trust. This is the most important day and you are involved with this person/place for many months. You want to make sure that you feel comfortable. We want your wedding experience to be fun, easy, efficient and memorable. There are so many discount internet sites that are “offering” designer merchandise at a fraction of the cost. The risks are high. Are you getting the actual designer item or a knock off? What are you going to do with it when it lands on your doorstep? What if it is not right? Who is going to help you accessorize and alter it? Who will be your shoulder to lean on in times of stress? This is your wedding day and the whole experience from shopping with your someone special to that hug on your final day should be perfect. You have to decide what it is worth to you to deal with a salon that has an authorized relationship with the designer and that has a physical place that you can go to handle your needs and concerns. A place that can provide you and your bridal party with all the necessary services from beginning to end . Everything has a price….What is it worth to YOU? Trans-shipping means a store that doesn’t carry a specific designer tells you that they can order the dress for you for less . Do your homework. Get on the designer’s website (1) www.jlmcourtue.com – buyer beware section) or call them and ask if they deal with this shop or internet site. Ask if they are authorized to sell their designs? If dresses by a particular designer are not featured in that shop or are very old, chances are they are not authorized to sell to you. What a store does is establish an illegal relationship with another store and orders the merchandise through them. They pay a small fee to the other shop or gets the other shop something they need that they are not authorized to sell. The problems that result from Trans-shipping are receiving merchandise late, incorrect or not at all. You are depending on your order going through a third party who has no relationship or vested interest in you or your day to a designer who has no idea that you exist. You can’t contact them if there is a problem because they don’t deal with the shop to which you gave your money . You also have to count on the “mystery store” to be paying their bills on time. Most shops who are involved in these practices are not financially sound. They are selling dresses for little over cost. They are trying to make money on quantity not quality. If the dress comes in damaged or the wrong size as they sometimes do , the store you purchased from can not call the designer to have it corrected. They must return it to the third party who then hopefully promptly takes care of sending it back to the designer and then back to your shop and then ultimately to you. This is all time wasted, if you even get it at all . Designers are cracking down hard on these shops and internet sites that are Trans-shipping. If the shop you purchased from or the shop they ordered from, which could be anywhere in the country, gets caught they not only close their account but cease all their orders and guess who doesn’t get their dress and is out their money………YOU!!! We have heard and worked with many brides who have been hurt trying to save a couple of hundred dollars and it ended up costing them more financially and emotionally. Everyone has a budget, we understand that. We just want you to understand the possible consequences of trying to buy a $2000.00 gown for $1200.00. Our suggestion-buy a $1200.00 gown from an authorized retailer who appreciates your business and will work hard to fulfill your every need. We are more than happy to educate, explain or help answer any questions you may have about internet discounting or trans-shipping. All the designers that we work with are exclusive designers who pride themselves on their craft and their service. They do not authorize or support any of these methods. 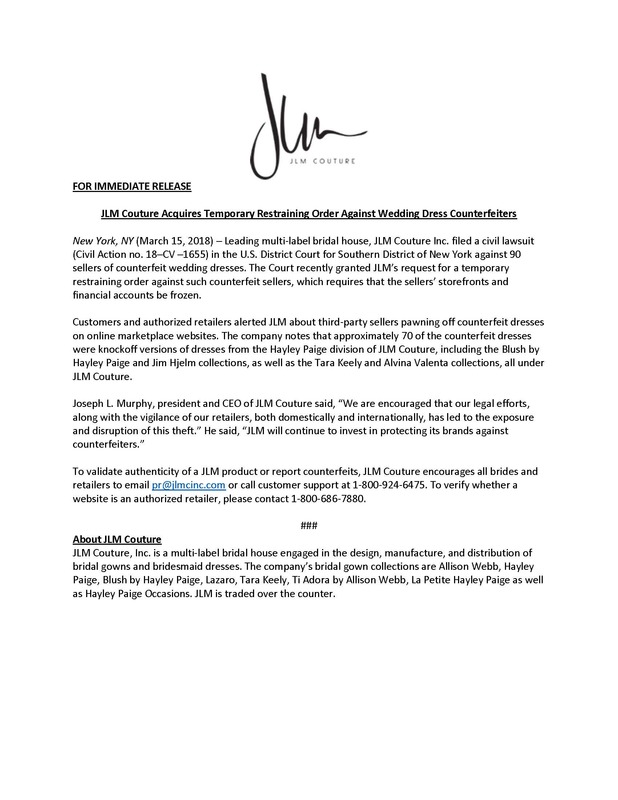 Some even have warnings posted on their websites.If you, however, find a lower price from an authorized retailer prior to your purchase that we consider to be fair and can be verified, we will be more than happy to educate, explain or help answer any questions you may have about internet discounting or Trans-shipping. All the designers that we work with are exclusive designers who pride themselves on their craft and their service. They do not authorize or support any of these methods. Some even have warnings posted on their websites. If you, however, find a lower price from an authorized retailer prior to your purchase that we consider to be fair and can be verified, we will be more than happy to match it.